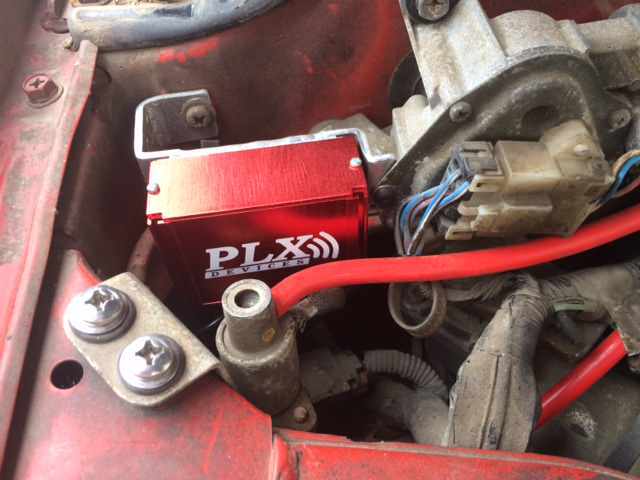 This is a HOW TO install a PLX wide band O2 sensor AFR gauge. This should also translate to other AFR gauge manufacturers out there. The hardest part is finding a place for the box. I did not want to install it inside because of all the wires that connect to it. The biggest harness is from the O2 gauge itself. I found a spot on the right hand side by the wiper motor. I made a small bracket to hold the main box. This box is pretty small and has tabs on the back I used to hold it. You can also Velcro it in place if you wanted to. The next step is to find power to the box. The main issue here is, it has to be switched power. I thought the easiest place to get switched power would be on the inside by the radio. I just installed a new aftermarket radio and noticed I had some extra connectors back there, or you can add an extra pigtail off the wire when you install the new radio jumper harness. Now you just don't want to plug into the wire, you want to use a relay to switch the power on. This makes it safer so you don't over use that wire and also this lets you create a place to have extra switched powers for other device that need it if you add them later on, example new boost level gauge. I have a 4 pin connector off my relay for future components. Also use a bigger gauge wire to run off the battery inside (mine is a 10awg) and don't forget to put a fuse on it. The picture below shows how everything is wires up. 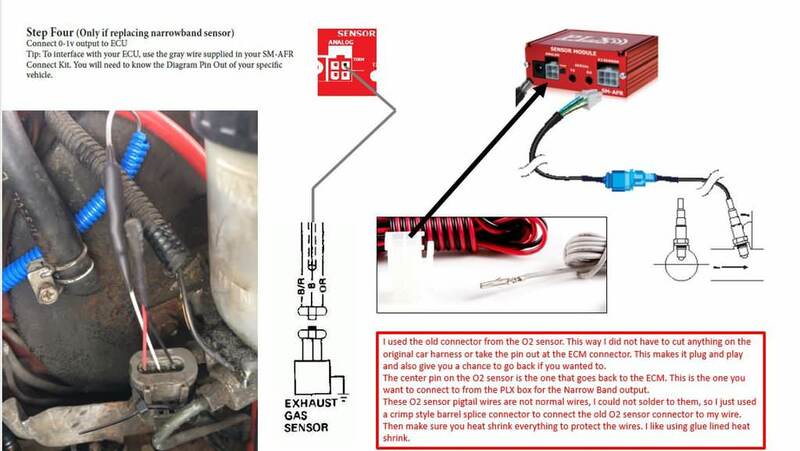 Now I wanted to use one O2 sensor for the new gauge and also for the car computer. This way you don't have to have an extra O2 bung welded on your exhaust. 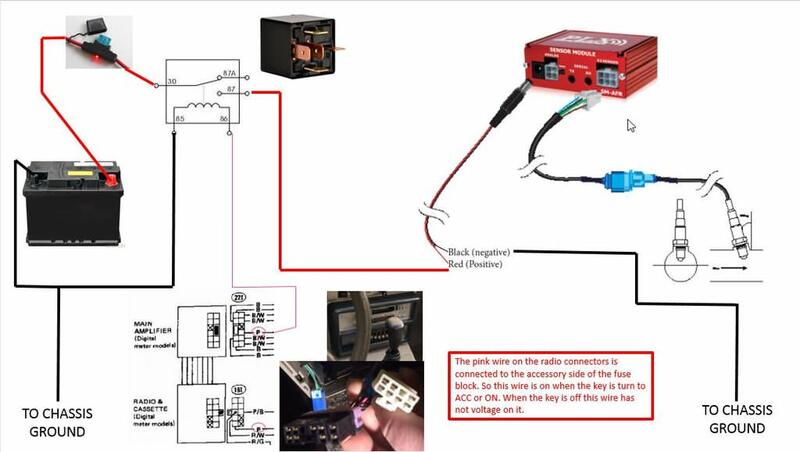 The PLX box simulates a narrow band signal that runs to the car computer. You just have to add the wires supplied to the 4 pin connector and then run this to the car computer. I wanted this plug and play so I cut the connector off the old O2 sensor. I then connected the wire from the PLX box to the old O2 connector. The center pin is what goes back to the car computer. The wires on the O2 sensor pigtail are not normal copper so you will have to crimp the new wire to the center wire. Also make sure you heat shrink all the wires after you are done. I cut the other two wires at different lengths so there was no chance of them touching and causing a short. Don't forget one wire still has power on it and the other is ground. So heat shrink these guys so they don't touch each other of the frame. There is a grommet hole right next to the brake booster. It has a rubber/plastic black plug. I removed this plug and added a grommet to protect the wires going through the firewall. This hole drops the wires on the right of the steering wheel column and real close to the radio cubby. Behind the radio is where I put my new relay and switched connector. Easy to get to and enough room to hide everything. Also a good place to connect to ground. The bracket holding the radio is what the radio is grounded to. I would also run wire loom on everything. This way it protects the wires from being rubbed on and causing a short. Plus it makes it look nicer.